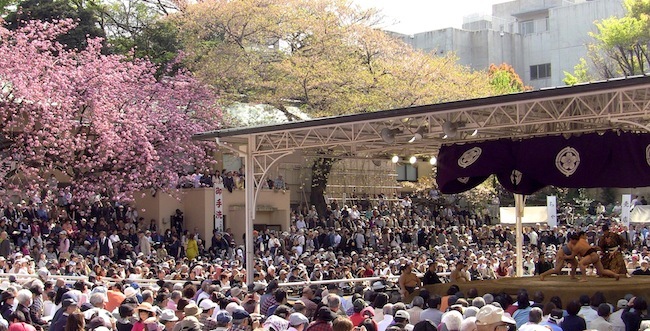 This is a little blast from the past – I was going thru some of my old archive footage and came across footage of an outdoor sumo exhibit from 2009 at Yasukuni Shrine that they do every April. I’ve gone to it a few times but only once got to see the two Yokozuna at that time face off against each other. Usually you can only see Yokozuna fight each other on the last day of the tournament, a day which it is quite difficult to get tickets for so this was quite a treat. Yokozuna is a difficult position to reach and only a few ever reach it. There has been up to four Yokozuna at one time and there has been times when there has been none. Asashoryu was Yokozuna from 2003-2010 and Hakuho has been one since 2007 so for only a short period of time could you see two Yokozuna compete since 2003. Every year on January 6th, to celebrate the coming year, the current sumo champion(s), Yokozuna, come to Meiji Shrine and perform a Dohyo-iri or ring-entering ceremony. For Yokozuna there are two styles – Unryu the more common is seen as a defensive stance and Shiranui is a more offensive stance. They are named after Yokozuna by those names – though there is debate that there was a mix up and that each wrestler actually performed the other’s style. Anyway, Hakuho performs the less common Shiranui style dohyo-iri and wears a Shiranui style rope which has two loops in the bow. I read somewhere there is a superstition that Shiranui has brought bad luck to previous Yokozuna who performed that style. It remains to be seen if Hakuho will escape such a fate. Long video discussing the retirement of Asashoryu, the yokozuna (sumo champion) of Sumo in Japan. Asashoryu announced his retirement recently. If you thought sumo a sport of slow moving fat guys in thongs engaged in an aggressive shoving match, guess again. As any follower of Sumo knows, Sumo wrestlers are fast, strong, and agile. They also know how to take a fall real well. And they get tossed around a lot. The following is a series of falls, tumbles, and throws from several tournaments: Sept ’06, May ’07, July ’07 in Nagoya, and Sept ’07. There’s also scenes from an outdoor exhibition in April ’07. I went early in the day for the Nagoya Basho and caught some of the junior wrestlers so this vid has wrestlers from the very top to the very bottom of the sumo hierachry. Sumo — quivering mounds of flesh set into sudden motion that is at once jarring and engaging. It’s the sport of gods, literally. However, it took me some time to appreciate sumo. Long before I made my way over to Japan, my image of sumo was not a very flattering one. 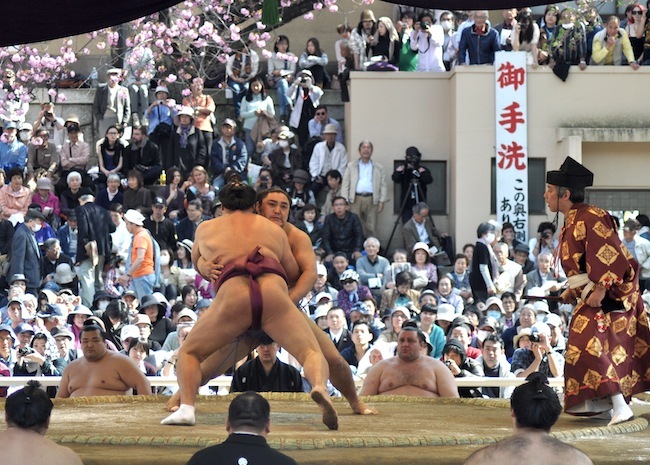 To me sumo was a match where two nigh-immobile mountains of flab come together with all the speed of erosion to push one or the other slowly out of the small ring they were in. In short, fat guys in diapers having a shoving match — not exactly my cup of tea. The erosion of my entrenched stereotype began with my first encounter with sumo. This encounter came from the TV broadcasts of the January tournament during my first month in Japan. At that time I was waiting for my new job to start up so I was lean on funds. My entertainment was limited to cheap beer, Doritos and whatever was on TV in my cramped little gaijin house. I just happened to stumble upon the broadcasts of the sumo tournament in mid-January. I couldn’t understand anything on Japanese TV at this point (and I still don’t; but for different reasons). Sumo, though, was simple enough to follow. What surprised me right away was the speed of these seemingly slow behemoths. They were shockingly fast and agile. Their speed dispelled the notion I once held that overweight Americans could compete in sumo tournaments. I used to think there was no reason to go to Japan to see a sumo match when similar sport could be had by throwing a free bag of potato chips on the floor of the local Wal-Mart. How wrong I was. 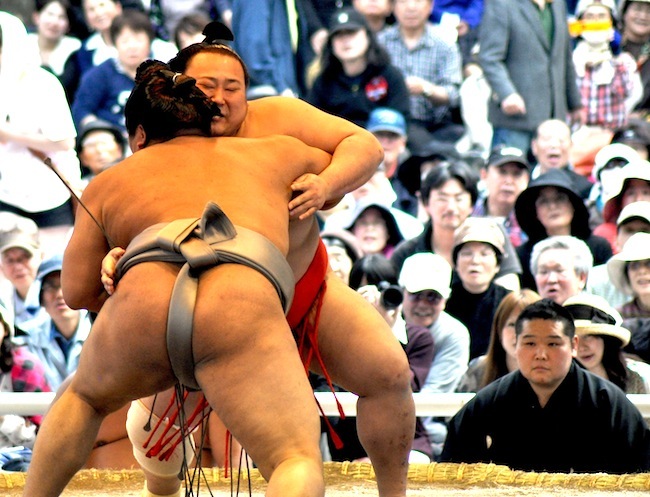 For one thing, despite appearance, most sumo wrestlers actually have less fat than their average working countrymen. What lurks under the deceptive rolls of flab is muscle — a lot of muscle. Sumo wrestlers “work” hard to get big, unlike my rotund countrymen who accidentally get big by eating cheese doodles all day on the sofa while watching TV. The wrestlers want this bulk for two reasons — (1) to give their thrusts more power and (2) to cushion the impact of their opponent’s blows. To achieve their dual goal of fat and muscle, sumo wrestlers keep to a strict regimen of exercise and eating. They start exercising early in the morning between 4 a.m. and 5 a.m. and do this for several hours. The wrestlers only eat twice a day but these are large meals after which they sleep. Lunch is the biggest meal and they sleep for two hours afterwards. Chanko-nambe is one of the main staples of a sumo wrestler’s diet. Chanko-nambe is a stew with no rigid ingredient list but a little bit of everything. It’s high in protein and consumed in great quantities to add the necessary girth a sumo wrestler needs. Not all sumo wrestlers though are the gargantuan titans of blubber that may spring to mind. In the 1990s, this type of image was enforced by Akebono (235 kilograms/520 pounds) and Konishiki (264 kilograms /580 pounds) both huge wrestlers in their own right but not Japanese. The current yokozuna (champion) are two relatively lightweight Mongolians — Asashoryu and Hakuho. Both of them have put on the necessary weight and tip the scales at over 300 pounds but their bodies still look relatively in proportion. The strength of these portly wrestlers is not to be underestimated. Over the long history of sumo, there has been tales of incredible strength by these stout giants from lifting huge heavy bales of rice to cannon balls weighing several hundred pounds. It’s no wonder that for many Japanese at a time when the average body build was smaller than today that they looked upon sumo wrestlers as superhuman. Agility is another surprising aspect of sumo wrestlers. Anyone who follows sumo knows these wrestlers will not only use their bulk and strength to win a match but their agility as well. Sometimes, this can be simply moving out of the way at the last moment and letting their opponent go sailing out of the ring on their own steam. Other times, an agile wrestler will quickly move to the side at the moment of contact and bring his opponent crashing down to the ground with one quick thrust. 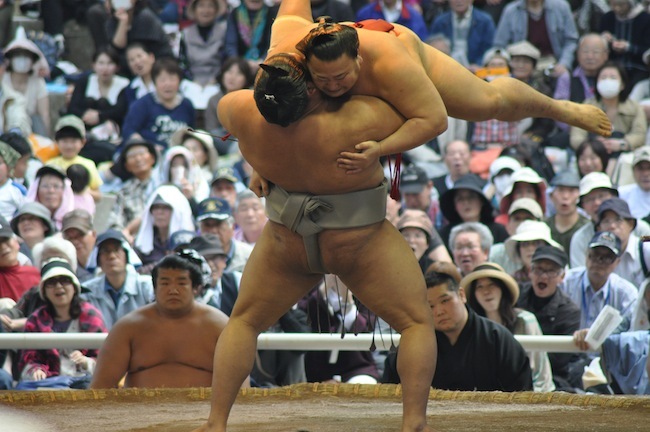 Sumo falls — this is another surprising element of sumo matches. The big guys tumble, fall or are thrown down quite a lot. Despite their weight and the force of their fall, the wrestlers usually get back up rather quickly. Back home, if a large fellow went down, they wouldn’t be getting up so readily. An ambulance and possibly a crane would be needed to get them back up. Sumo wrestlers train in falling because the frequency of falls and tumbles are rather high. It’s part of what makes the matches so exciting. The matches aren’t the slow-moving shoving matches I once ignorantly assumed they were. From my first initiation into the world that is sumo, I have since acquired a great appreciation for this sport that is not only a sport but a religious ritual as well. I try to catch at least one day of sumo whenever the tournaments come to Tokyo, which is three times a year. As interesting as it is to catch sumo on TV, nothing beats the excitement of watching it live. This another video that I’ve upload to Current TV. It’s a “Director’s Cut” of my recent sumo video with a title sequence, 30 seconds of extended footage, and extra tidbits of information.